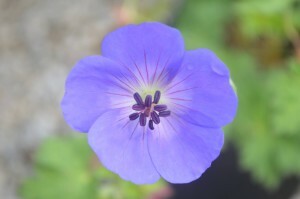 Geranium Rozanne: Not to be confused with the annual Pelargonium geraniums seen in containers everywhere, the blooms of this perennial are a beautiful violet-blue with a white center. Cranesbill, as it is more commonly known, provides a long-blooming, prolific blue flower that works well in borders, rock or cottage gardens, patio planters, and containers and do best when grown in mass. They are a full sun/partial shade plant and prefer a fertile moist soil, and will grow to be around a foot and a half tall and 2 feet wide. It is a very low maintenance plant and requires a medium amount of watering. Flowers will continue through the heat of mid-summer. Call and make an appointment today to have some of these blue beauties added to your garden for a summer filled with endless color.